On the shiny employment report published today, the only dark spot was the composition of the decline of unemployment. The jobless rate fell because the labor force participation (LFP) rate plunged, even though the employment-population ratio (EPR) fell a little too (from 58.94% to 58.87%). The chart shows that, of the 0.437 percentage point decrease of the jobless rate, 0.552 was attributed to a decline of the LFP; while the fall of the EPR contributed to a rise of 0.115 percentage points of the unemployment rate. The last bar of the chart shows that, over the past 12 months, most of the accumulated decline of the jobless rate is attributable to a lower LFP (the "bad" kind of decline of unemployment). That's been the norm since at least 2010. The first (second) line on the right-hand side is the contribution of the change of the employment-population ratio (the labor force participation) to the change of the unemployment rate. 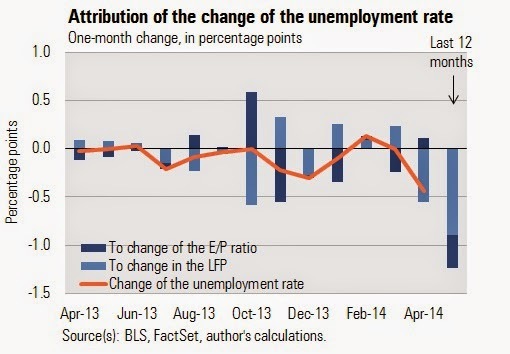 An increase of the EPR (LFP) decreases (increases) the unemployment rate, and vice versa.